We've had some news the past two weeks so I thought I'd give everyone an update. We found out about 2 weeks ago that Tyler is breach, and he has continued to be breach through Mk's last doctor's appointment this week. So, we have a C-section scheduled for next Friday, September 7, at 7:30am. As long as Tyler doesn't do anything exciting between now and then, we'll get to see him in a week! I'm planning on updating the blog next Friday or Saturday when things settle down a bit (do things ever settle down?). Mk, Tyler, and I appreciate your prayers over the next week. Sorry it's been awhile since I've updated. 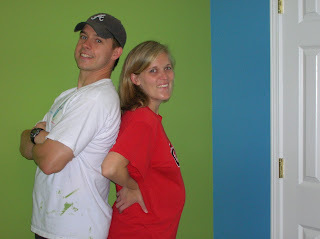 I added some pictures here and on flickr of recent pictures of Mk and pictures of us working on his room. We just finished 36 weeks. Everything is going well and Mk and Tyler are both healthy but very hot! Hopefully we'll have more news soon. The blog should be updated whenever there is anything more exciting to share.